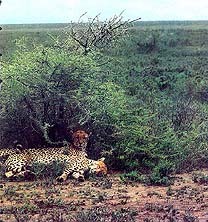 On an East African plain, two minibuses, loaded with tourists and camera equipment, approach a family of cheetah’s resting in the ragged shade of a thorn tree. Moments later, two more vehicles arrive; their passengers join the chorus of clicking cameras and exclamations in various languages. The rare and elegant speed champions of the animal world beat an undignified retreat into the nearby bushes. Six miles away, outside the boundary of the Masai Mara National Reserve in southwestern Kenya, a group of well armed Masai herdsmen are slowly moving their cattle toward a distant settlement in the hills,. The men sing and whistle as they unknowingly drive the herd straight toward another cheetah family crouched in a patch of tall grass. Undetected by the Masai, the cheetahs flee for cover. Are human activities chasing these endangered cats to extinction? Some wildlife experts believe that even in and around Africa’s national parks and game reserves human activity is adversely affecting the cheetah and other endangered animals. To determine whether this is the case, my wife, Lida, and I spent seventeen months investigating the effects of such activity on cheetahs in Kenya’s Mara region. We were able to compare many aspects of cheetah behavior and ecology in various areas affected by human disturbance. We observed cheetahs as they encountered tourists vehicles, professional film-makers, Masai tribesmen, park service personnel, and would-be poachers. For comparison, we spent hundreds of hours unobtrusively watching the same cheetahs when these disturbances were not present. In the Mara region, the vast grasslands of the northern part of the Serengati ecosystem are subjected to two principal land uses: as a game reserve and as a rangeland for livestock. The 580 square-mile Mara reserve attracts about 45,000 tourists per year. These visitors tour the area by motor vehicle, viewing one of the world’s greatest wildlife spectacles. Reserves and parks help make tourism Kenya’s second largest industry. Surrounding the Mara reserve on three sides are more that 1,160 square miles of similar habitat, which supports Masai tribesmen and their livestock, as well as wildlife and some tourism. South of the reserve lies the much larger Serengeti National Park of Tanzania and two wildlife management areas. The cheetahs move freely between the reserves and “Masailand,” as the Mara region is generally known. Although the cheetah is one of the most sought-after creatures in the Mara, the wily cats often escape detection by tourists and their guides. The cheetahs’ spotted coat and concealment behaviors often enable them to be virtually invisible or to disappear suddenly when they have had enough of tourists. More than 500 tourist vehicles passed within 800 feet of cheetahs we were observing from a distance, but about one-third of the groups never discovered the cats. Cheetahs’ responses to tourist vehicles are variable. Some individuals are much more tolerant of approaching cars than others. Drivers who approached with care were usually rewarded by being able to observe the cheetahs at length. Cars moving toward cheetahs in a slow, indirect fashion were usually able to avoid frightening them away. A female and her nearly grown cubs find respite from the midday sun in the scant shade of a thorny bush. Cheetahs can usually rest undisturbed during the hottest part of the day because tourists also avoid the scorching heat. Two young cheetahs peer into the interior of a Land Rover. Such habituation to machines is a sign of “polite” cheetah, a term used by safari operators for individuals that don’t flee from approaching tourists vehicles. Cars moving quickly and directly to the cheetahs were much less successful. Cheetahs (and most other animals as well) react nervously when a large number of cars form a circle around them. People getting out of cars caused a reaction in the cheetahs even at surprisingly long distances – 650 feet or more. When tourists got out of a vehicle near cheetahs (to the consternation of their guides), the cheetahs usually moved away quickly. Camera noises, soft talking, and quite movement inside the car almost never had a visible effect. In general, patient drivers and cooperative observers were rewarded by a tolerant response from the cheetah. Certain familiar cheetahs were remarkable tame and easy to approach, but others earned from us such nick-names as “the Phantom.” This male fled every approaching vehicle before it came within 300 feet. A female that we called Polly was an extreme case of the opposite sort. Hundreds of tourists see and photograph her each year. Professional safari drivers in the area refer to cheetahs like her as “polite.” (Cheetahs like the Phantom are said to be “cowardly.” We prefer referring to the latter type as shy.) Even noisy, rapidly driven cars often lurched up to within fifteen feet of Polly without provoking her to flee. She has been the star of several wildlife movies in Europe, and has modeled for some of the best-known wildlife photographers in the world. While we were conducting our study, one cinematographer even filmed her giving birth to a litter of five cubs. A cheetah’s hunting success might be adversely affected if it has to spend much time and energy escaping tourists. This is probably true for cheetahs like the Phantom, but we were surprised to find that hunting success was slightly higher for car-tolerant cheetahs when the cars were present. They often appeared to use cars as a screen in order to approach gazelle, impala, and other favored prey in open country. Arriving cars also served to distract prey that had been maintaining a safe distance from a hungry cat. 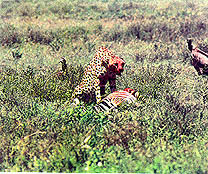 Tourist vehicles seldom drive polite cheetahs off a kill before they are nearly finished eating. In one instance we did see a rather shy cheetah driven off a kill by an approaching vehicle, and a hyena immediately appropriated the carcass. This incident was another demonstration that a tolerance of tourism may have survival value (in this case, for the hyena). While taking a drink, this mother makes sure that her cubs are close at hand. Lions, leopards, and hyenas often kill young cheetahs. Although a single encounter with a vehicle is seldom a major disruption for a cheetah, the cumulative effect from a succession of vehicles is potentially more serious. Shy cheetahs would sometimes be chased by one car after another; at times twenty or more cars would be involved over an entire morning or afternoon period. Two shy males cheetahs that were hunting in the reserve just after dawn were three miles away by noon, hiding in thick cover outside the reserve. In parks such as Amboseli National Park in Kenya, where the density of tourist vehicles is several times as great as in most parts of the Mara, cheetahs may be disturbed so frequently that their hunting or other important behaviors are disrupted. Researchers working in this heavily visited park have suggested that this may be the case. Vultures wait their turn as an adult male cheetah makes a meal of a zebra foal. 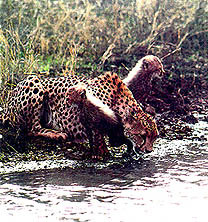 Cheetahs are often driven off a carcass by other carnivores. Some shy cheetahs gradually learn to tolerate vehicles. Our observations of professional photographers at work with cheetahs showed this clearly. Two cheetah families that we spent hundreds of hours studying were also the stars of wildlife motion pictures. Several professional cinematographers filmed them periodically throughout their development. To make such a film, the photographer must spend many hours close to the subjects (but inside a vehicle). As the days, months, and hundreds of feet of film rolled by, the cheetahs gradually changed from shy phantoms to exceedingly polite animals that even made occasional contact with stationary cars. Although they are usually careful to minimize their impact, photographers and other wildlife observers who stay with cheetahs for long periods mark the location of the animals. The result is that other vehicles are attracted to the spot and the cheetahs may be chased out of the area. 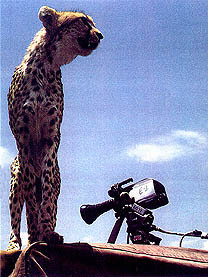 To avoid attracting tourists to cheetahs, some filmmakers work primarily in Masailand, where tourists are scarcer. Although the Masai are traditionally feared by other peoples, their sparse distribution and tolerance of wildlife has enabled many animals to thrive in Masailand that have been virtually exterminated in the lands of agricultural tribes in East Africa. Our data indicate that the Masai are usually tolerant of, or at least indifferent to, the cheetah. They universally reported that cheetahs almost never bother their carefully guarded herds, but lions sometimes do. They seldom see cheetahs, although the cats and the Masai are often in the same area. In nearly all cases, the cheetahs detect the tribesmen’s approach at long distances and move away quickly without being detected. Since the Masai have taboos against eating most types of wild neat, they don’t compete with the cheetah for prey. The Masai’s dogs, however, may pose a problem for cheetahs. On one occasion, we observed a big male cheetah that had eaten a wildebeest calf drag himself and his distended belly to the shade of a nearby tree to sleep off the meal. Before he had rested long. However. Two Masai boys carrying spears came strolling down a nearby road with four dogs at their heels. When the cheetah raised up to investigate the noise, the dogs spotted him, ran up barking. And encircled the tree. The cheetah stood up, bristled like an alley cat, and bared his teeth. The dogs ran straight back to their startled masters, and the cheetah escaped in the ensuing confusion. Another time, at dusk, a mother cheetah defended her four small cubs against Masai dog, but two cubs were missing the next morning. We witnessed another example of the interrelationship between cheetahs and Masai at a small Masai settlement. This collection of low huts made of sticks and cow dung, surrounded by corrals made of cut thorn bushes had been abandoned for several weeks when a family of cheetahs approached the place. Eventually the mother and her large cubs cautiously entered the compound and thoroughly explored the dwellings. We saw cheetah families playing near abandoned settlements on two other occasions. Masai are traditionally quite mobile, changing abodes every year or so; apparently cheetahs quickly reclaim territory they have temporarily lost to these nomads. 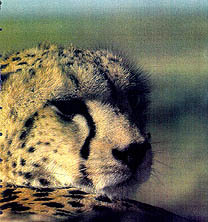 Cheetah must cope with other, more permanent types of human dwellings in the Mara. Tourist are accommodated in luxurious tented camps and hotels. An even greater number of service personnel – park rangers, tour-vehicle operators, cooks, and other staffers – live nearby. In the vicinity of these tourists facilities and along the roads, construction projects employing many workers are currently in progress. All these people add up to a substantial non-Masai population in the Mara region. When these people are on foot, cheetahs show the same fear of them as they do of the Masai. Oddly enough, road graders, bulldozers, and even airplanes elicit milder responses – about the same as tourists vehicles. Once, as an airplane landed and taxied by a cheetah about eighty feet away, a tourist-tolerant male seized the opportunity to kill a distracted Thomson’s gazelle. And did not abandon his meal even when the plane taxied back to permit the passengers to take pictures. Construction sites appeared to have less impact than might be expected. When the workmen were not around, cheetahs were found of lying on the fresh dirt piles left by the bulldozers. Polly, the very tolerant female, even had a litter of small cubs in a dry streambed only about 300 feet from a small gravel quarry. One consequence of this tolerant behavior was that word of her convenient location spread rapidly, and twenty tourist vehicles or more would show up each day that she remained there. Since she was just off a main thoroughfare, it was not unusual for her to have up to six vehicles at a time for company throughout the morning and afternoon period. Under such circumstances, she seemed reluctant to leave the cubs, and her hunting was restricted to periods of low visitation: early morning, noon, and evening. Thus, cheetahs may be at some disadvantage when they try to raise cubs near areas where people are concentrated. Some “polite” cheetahs are among the most photographed animals in the world; their “reward” is the prey they capture during the commotion created by tourists and photographers. Little is known about the potentially damaging effects of human modification of drainage, soils, and vegetation that accompany facility development in and around African game parks. Care must be taken to avoid changing the ecology of such areas and thereby upsetting the balance between the productive vegetation and the varied wildlife in these areas. Paradoxically, while tourists and native people pose potential threats to East Africa’s wildlife, they may also be the animals’ only hope. We found that areas in the Mara little-used by either tourists or Masai were potentially the most dangerous for cheetah and other endangered animals because of poaching. Wildlife authorities in Kenya feel, and we are inclined to agree, that distributing tourist facilities and ranger offices over the wildlife areas as evenly as possible would discourage poachers by monitoring what is going on. Juvenile cheetah often play “cat and mouse” with such prey as this infant impala. Young carnivores learn hunting skills as they repeatedly stalk, chase, and capture small creatures that they will eventually kill and eat. Poaching in the Mara seems to be largely restricted to times and places where other people are not likely to be – specifically, far from tourists facilities (except in the rainy season when there are very few visitors in the Mara). Most poaching involves black rhinoceros, elephant, and leopard. The cheetah’s hide brings a much lower return than the products from those other creatures (a cheetah’s skin has about one-third the value of a leopard skin), and consequently cheetahs are less desirable to poachers in the Mara at present. Cheetah skins from other parts of Africa continue to turn up on the international market, however. Unlike leopards, cheetahs are not easily baited with meat. If poachers should wish to hunt cheetahs from a car, however, polite cheetahs would disappear as quickly as the rhino has in East Africa. The market for live cheetahs is another potential threat to the animals in the Mara. Catching cheetah cubs to sell is a common practice in some other African countries. Capturing live adults to train them for sporting purposes, such as blackbuck hunting, was cited as the likely cause of the cheetah’s extinction in India in the 1950s. We saw no instances of cheetah poaching in the Mara, and persons carrying weapons were never observed to get close enough to use those weapons effectively even if they wished. But ten young cheetahs did die during the study. Cubs were killed by lions, hyenas, a leopard, and in one instance, possibly, a male cheetah. That large African carnivores kill each other’s young – and in some cases, the young of their own species – has been well documented. This adult cheetah picked the hood of a Toyota Land Cruiser on which to rest. Such tameness could prove fatal to the big cats if poachers in East Africa decide they are profitable. Although instances of cubs being killed by automobiles, drowning in a flash flood, or burning in grass fires set by Masai or poachers have been reported from the region in past years, 40 percent of the mortality among the cubs we studied was caused by other carnivores. The cheetahs’ high birth rate may compensate for this loss, however. Their breeding potential is higher than that of any of the other large cats, and litters of four, five, or even six cubs are not unusual. Our observation that about half of the sixty-one known cheetah living in the region are less that two years old (but past the critical first three months of life), suggests that cheetahs may be increasing in the Mara. The many encounters between cheetahs and other carnivores hint strongly that these larger and more powerful animals, and not humans, are usually the cheetahs’ greatest problem. These competitors seem to be more numerous in the reserve than in adjacent Masailand, and we found that the density 9f cheetahs was twice as high in Masailand as in the reserve. Several rangers and Masai in the area have suggested an explanation for the patterns of distribution we observed: Lions and, to a lessor extent, the other large carnivores, are much more numerous inside the serve, where they are protected, than outside, where they are likely to come into conflict with the Masai over livestock. The cheetah is an exception, they say (and our data confirm this). Outside the reserve, cheetah cubs face fewer problems with other carnivores, and they coexist well with the Masai because unlike lions, leopards, and hyenas, cheetahs seldom take livestock. The cheetahs detect and flee from people on foot beyond the range of most weapons, and they pass freely through sparsely populated areas without being distracted from their hunting to any great extent. If this is true, then the effort to preserve cheetahs in the parks and reserves of East Africa would benefit from buffer zones – adjacent boundary areas with complementary land uses. The most compatible land use appears to be multiple-use range management (which fairly well describes the Masai’s life style). Such lands produce both livestock and wildlife, but lions are likely to be kept in check because of their relative incompatibility with even low-density human populations. Human proximity is not new to the cheetah. Anthropologist Richard Leakey of the National Museum of Kenya points out that humans and their nearest ancestors have frequented the Mara for three million years or more. So, presumably, has the cheetah. If current conditions in the Mara region were to remain stable, I believe the cheetah would have a good chance of not just surviving but even increasing in numbers. Human activity, however, will undoubtedly continue to change the land. Intensive fenced ranching and large-scale wheat farming are on the increase in the Mara region. Wildlife authorities are already killing buffalo, wildebeest, and other grazers that are invading the Mara wheat fields, and strong, expensive fences are being erected. These agri-business schemes are financed with large loans from the World Bank. Tourism, too, could possibly increase in the Mara until it makes the area less suitable for the cheetah. This may have already happened in a few national parks in Kenya. On the other hand, a period of global economic decline or political instability could result in diminished tourism, leaving the superb park system of Kenya without its present strong economic justification. But for now. We can still witness the breathtaking speed and agility of cheetahs, in spite of other carnivores and human interference. Like all creatures, though, this great cat is completely at the mercy of our uncertain future.